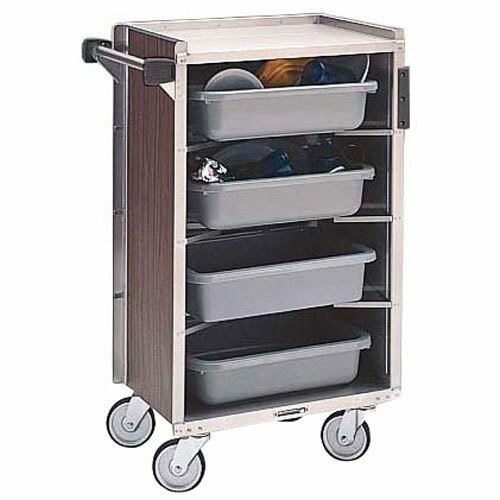 Lakeside 890 Medium-Duty Stainless Steel Enclosed Bussing Cart with Ledge Rods and Walnut Finish - 27 3/8" x 17 5/8" x 42 7/8"
Lakeside's enclosed bussing carts are great for when you need the strength and reliability of stainless steel but need a nicer, more upscale look. I've got a couple of examples with me here today. This one, showcasing our optional door. Other options are going to include our bussing accessories for waste and flatware. This is a higher capacity unit and will hold 6 bus tubs. Over here you'll see a unit that looks a lot like our other utility carts, but what your guests see is the laminate finish that matches your décor. So if you're looking to step up from a stainless steel utility cart, Lakeside has the enclosed bussing cart to fit your needs. If you need the rugged durability of stainless steel utility cart, but want a more upscale option for use in front of the house applications, look no further than Lakeside's enclosed laminate finish bussing carts! Allowing its users to maintain a fast-turnover dining area, this Lakeside 890 stainless steel enclosed bussing cart with ledge rods and walnut finish will serve as an essential item in your operation's clean-up efforts. In addition to sporting a stylish finish, this item's integrated ledge rods are designed to hold up to four standard 15" x 20" bus boxes inside and one on the top for increased capacity. Each stainless steel ledge measures 16" x 22" and has a clearance of 8". 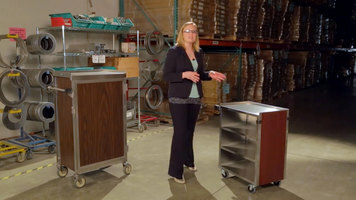 The cart's compact size makes it easy to move throughout crowded dining areas, and all welded angle leg construction ensures a durable unit that's also easy to clean. Four no-mark, extra load cushion tread wheels are designed to absorb impact and reduce vibration and noise. The Lakeside 890 enclosed cart with vinyl finish is recommended for medium-duty use. This item arrives fully assembled, and requires no additional assembly prior to use.